My wife and I are both going through the book. We're on Whittler. I found amazing economy and skill in the use of the pen tool that we can't duplicate. We can't even figure out how it was done. If you look closely at the file, you'll see how few points create the leaf pattern. But also, look at the grey "through the leaf" holes in the leaf pattern. These seem to be independent, but there are no independent curves. The whole background appears to be a single curve. How was this background pen tool file created? What are the secrets to such economy of the pen tool? How was the gray "holes" in the leaf pattern created? We notice overlapping lines reverse light/dark tints. Graphics or other files can be added by selecting the "more reply options" button while making the post. Mr. Limoncelli's work is well known and admired on the forum. Its not surprising you find the economy and skill remarkable. That is something that comes with lots of practice. 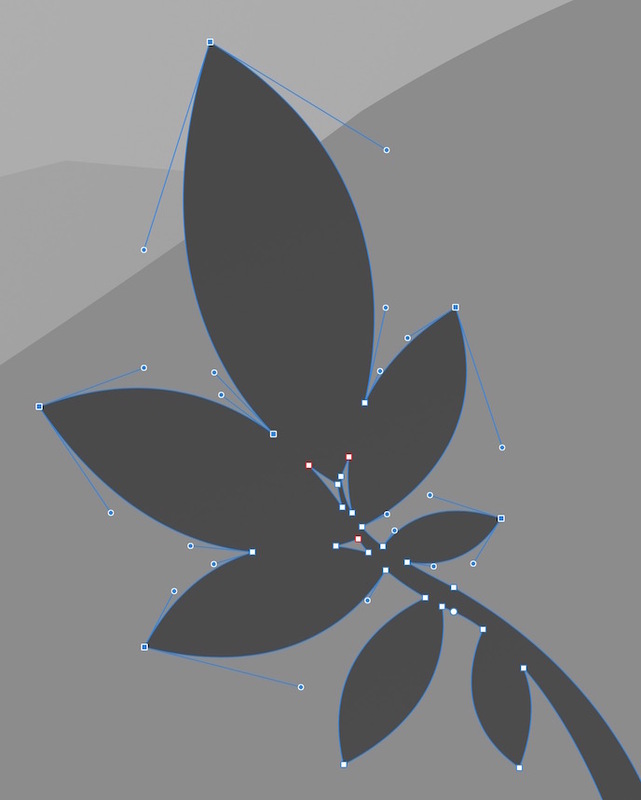 In general, when doing vector drawing, it is best to lay down as few nodes as possible. For example, a circle can be made w. just 3 nodes forming an equilateral triangle, and then turned to a circle by carefully adjusting the nodes' control handles. It is easier to use 4 nodes, and most times that is more convenient. But if the illustration becomes quite large, thousands of nodes, a bit of economy can be desirable. The leaf holes appear to have been made by drawing separate "hole" curves over the leaf mass, and then added to the leaf curves, and given the same grey color as the underlying layer. Here's a small exercise you might want to try. Use the pen or pencil tool, and draw some simple shape, say the outline of a bird, or a tree. Don't bother much w. accuracy. Make as many nodes as you like. When the outline is almost complete, with the last node close to the 1st. switch to the node tool, and click on the close curve widget in the tool context bar. Now there is a closed shape. The nodes can be moved around to get a better approximation of the desired shape. If certain details can't be made, add a few nodes. There may be long portions of line where there are extra nodes that can be removed because the control handles for the outlying nodes are sufficient lo bring the line back to the curve it should have. Study the way the various layers are stacked in the tutorial files. The standard is that the bottom is covered by any of the next layer above it that overlaps. And so on. A common problem when trying to attach files here is that you have to remember to press the 'Attach This File' button after browsing to the file. Yes, that was the portion of the study files I looked at earlier. Upon thinking it thru a bit farther, I'm inclined to think the hole curves were not added, but either subtracted or combined with the larger leaf shape. Notice the red node dots. That is an indicator of a closed outline. Or, I suppose in this case, and in-line. Attached is a screen cap of the area with a number of nodes selected so you can see the control handles. A simple way to create a leaf shape is to overlap two circles, select both with the Move Tool and click on the 'Intersect' icon in the Geometry section of the Context toolbar. Use identical circles if you want the leaf to be symmetrical. The above method will give you leaves with four nodes: sharp nodes at the two points and smooth nodes at the sides. If you want to reduce the number to two, you can switch to the Node Tool, delete one of the smooth nodes, drag the curve back out again and then repeat with the other smooth node, but it probably isn't worthwhile being too fussy about this for a simple drawing. The grey "through the leaf" holes are exactly that: they're holes, left there when you 'Add' overlapping leaf shapes. So if you draw a stem and a number of leaves, select them all and click on the 'Add' icon in the Geometry section of the Context toolbar, you should end up with something similar to the screenshot that you posted. So what I think Mr. Limoncelli did was create several grass, leaf, branch, and stem shapes, position them connected to his underlying large trees & ground outline shape, and then clicked the add button to connect them all together. Brilliant! In the book tutorial he had us use the pen tool in polygon mode to create the underlying ground and tree shapes, which gives a stilted unnatural linear shape to the trees and ground. I bet that he selected all points and converted them to pen mode shapes afterward to smooth out all of the outline points. His outline is all pen mode points. I learned a lot about sequence and process for creating pen shapes. Originally, I thought he drew the large background, broke the line, created the leaf and grass shapes, and then connected the curves. That would have been tedious to say the least. Neatly combines the whole group into a single efficient curve!